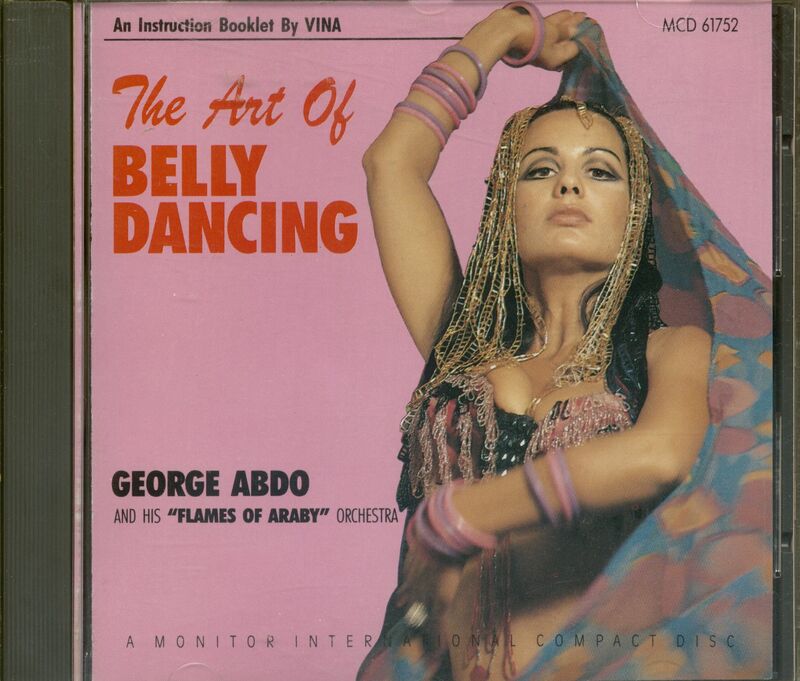 Belly dancing is an ancient art. 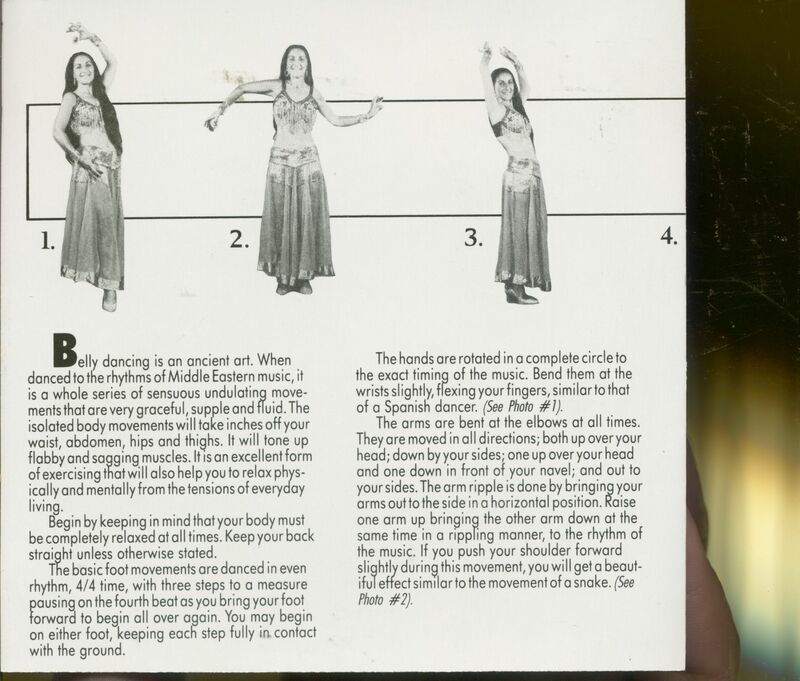 When danced to the rhythms of Middle Eastern music, it is a whole series of sensuous undulating move-ments that are very graceful, supple and fluid. The isolated body movements will take inches off your waist, abdomen, hips and thighs. It will tone up flabby and sagging muscles. It is an excellent form of exercising that will also help you to relax phys-ically and mentally from the tensions of everyday living. Begin by keeping in mind that your body must be completely relaxed at all times. Keep your back straight unless otherwise stated. 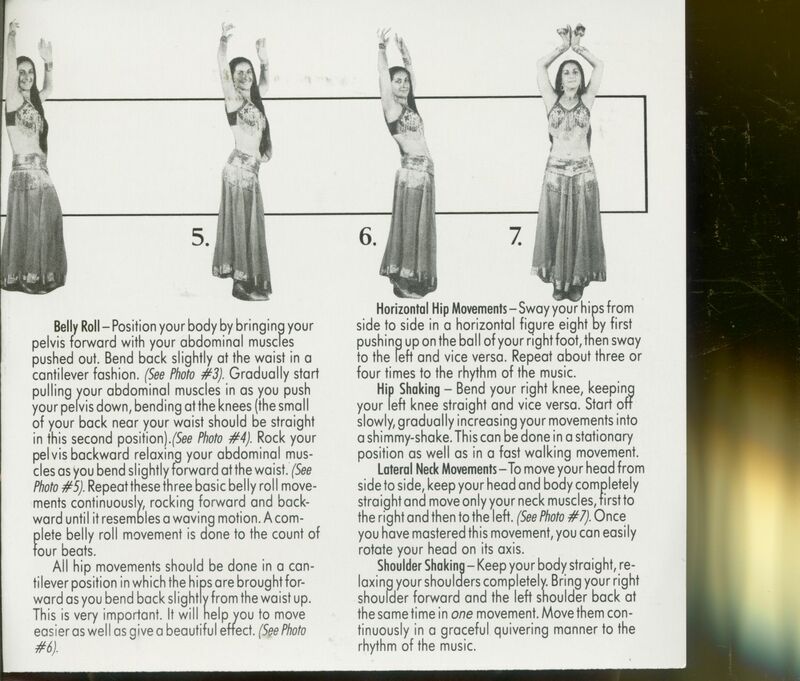 The basic foot movements are danced in even rhythm, 4/4 time, with three steps to a measure pausing on the fourth beat as you bring your foot forward to begin all over again. You may begin on either foot, keeping each step fully in contact with the ground. Belly Roll — Position your body by bringing your pelvis forward with your abdominal muscles pushed out. Bend back slightly at the waist in a cantilever fashion. (See Photo #3). Gradually start pulling your abdominal muscles in as you push your pelvis down, bending at the knees (the small of your back near your waist should be straight in this second position). (See Photo #4). Rock your pelvis backward relaxing your abdominal mus-cles as you bend slightly forward at the waist. (See Photo #5). Repeat these three basic belly roll move-ments continuously, rocking forward and back-ward until it resembles a waving motion. A com-plete belly roll movement is done to the count of four beats. All hip movements should be done in a can-tilever position in which the hips are brought for-ward as you bend back slightly from the waist up. This is very important. It will help you to move easier as well as give a beautiful effect. (See Photo #6). Horizontal Hip Movements—Sway your hips from side to side in a horizontal figure eight by first pushing up on the ball of your right foot, then sway to the left and vice versa. Repeat about three or four times to the rhythm of the music. Hip Shaking — Bend your right knee, keeping your left knee straight and vice versa. Start off slowly, gradually increasing your movements into a shimmy-shake. This can be done in a stationary position as well as in a fast walking movement. Lateral Neck Movements—To move your head from side to side, keep your head and body completely straight and move only your neck muscles, first to the right and then to the left. (See Photo #7). Once you have mastered this movement, you can easily rotate your head on its axis. Shoulder Shaking — Keep your body straight, re-laxing your shoulders completely. Bring your right shoulder forward and the left shoulder back at the same time in one movement. Move them con-tinuously in a graceful quivering manner to the rhythm of the music. Back Bend — A back bend should be included with any floor work that you should do. Do this gradually to prevent straining yourself. It is a beautiful movement and is an excellent exercise for strengthening your spine and firming your ab-dominal muscles and waistline. (See Photo #8). Finger Cymbals (Zils) — The finger cymbals are the most difficult to master. Although they are played to the beat of the music, they are not played to the same timing of the hands and feet. They are a very important and necessary part of the dance. Place one cymbal on your thumb and one on the second finger of each hand. (See Photo # I). Hit them strongly together and release them quickly to get a ringing sound. 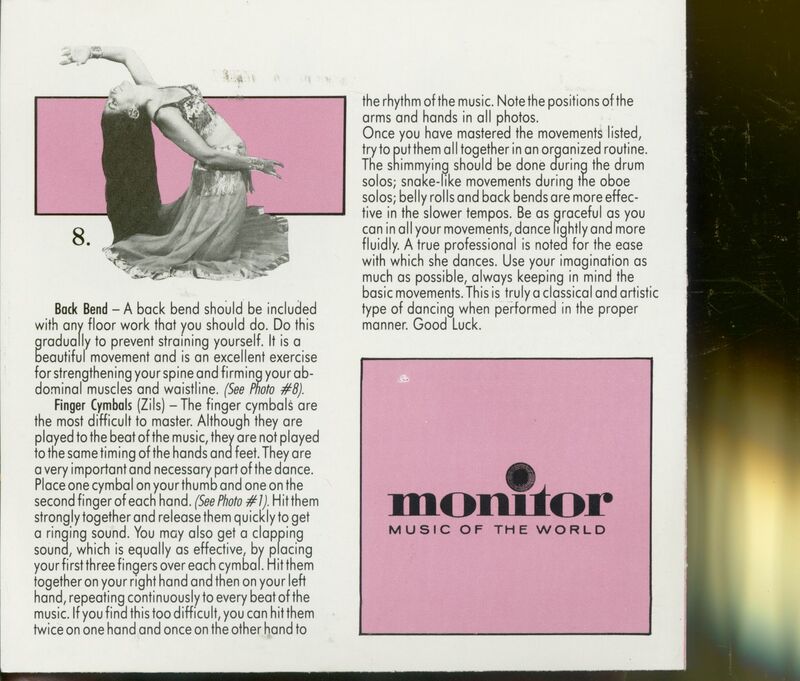 You may also get a clapping sound, which is equally as effective, by placing your first three fingers over each cymbal. Hit them together on your right hand and then on your left hand, repeating continuously to every beat of the music. If you find this too difficult, you can hit them twice on one hand and once on the other hand to the rhythm of the music. Note the positions of the arms and hands in all photos. Once you have mastered the movements listed, try to put them all together in an organized routine. The shimmying should be done during the drum solos; snake-like movements during the oboe solos; belly rolls and back bends are more effec-tive in the slower tempos. Be as graceful as you can in all your movements, dance lightly and more fluidly. A true professional is noted for the ease with which she dances. Use your imagination as much as possible, always keeping in mind the basic movements. This is truly a classical and artistic type of dancing when performed in the proper manner. Good Luck. 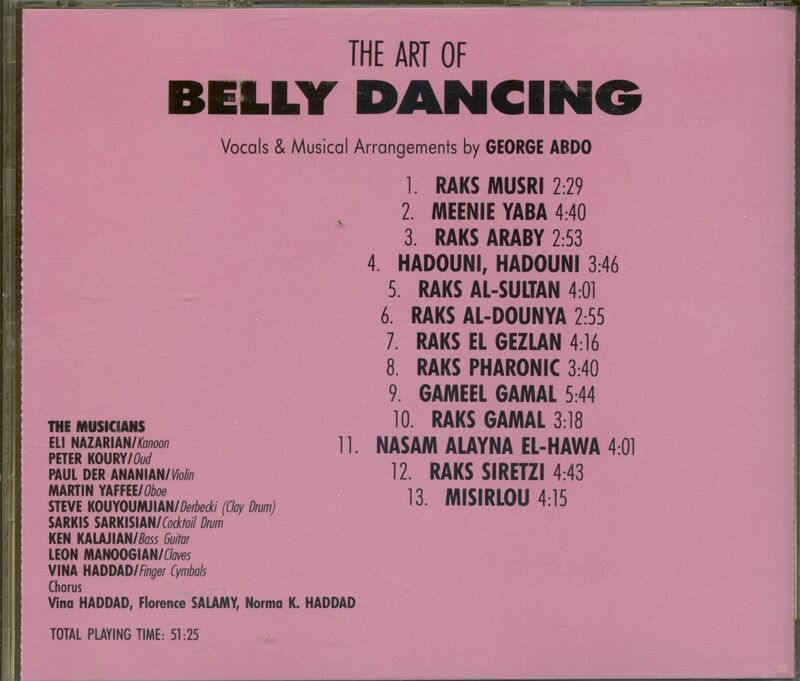 GEORGE ABDO needs no introduction to any aficionado of belly dance music whether they be belly dance teachers, students of the art or just plain lovers of music of the Middle East. His spectacular successes with "The Art of Belly Dancing,- "The Joy of Belly Dancing" and "Belly Dancing With George Abdo" have given countless hours of enjoyment to the practitioners of belly dancing. 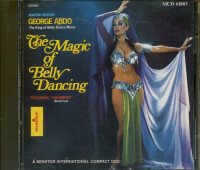 The present album represents the summit of George Abdo's artistry. Five of the selections are original compositions by Abdo and one of them, Sahirrnee is a bolero-rhythm show stopper which no discriminating belly dancer could resist. So dance, or just listen if you can sit still, to this unique contribution to the art of belly dancing. 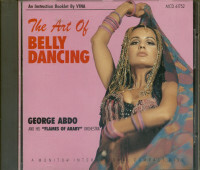 Customer evaluation for "The Art Of Belly Dancing (CD)"